ARLINGTON, VA--(Marketwire - Sep 12, 2012) - Can't wait for the 5 o'clock social hour to begin? One Crystal City hotel bar is ringing in evening specials nearly two hours early and offering great specials in a newly renovated and relaxing atmosphere. Travelers and locals alike can start the evening early with BELL20 American Tavern, where every weekday this lively tavern rings in its specials before other bars in Crystal City with a starting bell at 3:20 p.m. Food and drink specials are available until the final bell sounds at 7:20 p.m., featuring several of Alexandria's own Port City Brewing Company's hand-crafted ales, such as the Port City IPA and Optimal Wit. Domestic large production draft beers start at $3.20 and more than 30 bottle beers are available at $1 off regular price. Featured wines are offered by the glass at $5.20, and the BELL20 special menu is ideal for those looking to save a little extra on this Crystal City, VA bar's tantalizing fare. Offering something to satisfy every taste bud, reduced price appetizers include American classics such as chicken wings, turkey chili cheese dip with chips, cheeseburgers with roasted sweet onion, warm pretzel rolls, and garlicky fries. For those with a more demanding hunger, entrées such as Port City Ale mussels, short rib sliders or the meatloaf sandwich are featured along with a variety of other menu items. Conveniently situated in the Crystal City Marriott at the corner of Bell and 20th Streets, the BELL20 American Tavern is an ideal site for afternoon or after-work gatherings. Guests can watch their favorite game at the circular bar, socialize at the plank wood top communal tables or lounge in the semi-private nooks with oversized booths instead of fighting with rush hour traffic and crowds. With BELL20's prime location just off the Crystal City Metro on the blue and yellow lines, catching up with friends or business associates couldn't be easier. A vibrant choice among Crystal City, VA restaurants, this Crystal City hotel's exciting new pub and restaurant offers travelers and locals alike a refreshing reprieve whether enjoying a drink with friends or a meal with family or business associates. Open daily for breakfast, lunch and dinner, restaurant dining includes made-to-order omelets and a hearty breakfast buffet, fresh salads and a full menu of tasty American classics. For more information, call 703-413-5500 or visit http://www.marriott.com/hotels/travel/wascc-crystal-city-marriott-at-reagan-national-airport/. The Crystal City Marriott at Reagan National Airport hotel is located near many of the area's popular entertainment and shopping venues, offering guests on-site Metro access and complimentary airport shuttle service. In addition to meticulous accommodations and outstanding service, the hotel is staffed with dedicated event managers, professional caterers and features over 10,000 square feet of state-of-the-art event space ideal for corporate meetings, business conferences, elegant wedding receptions and grand social affairs. 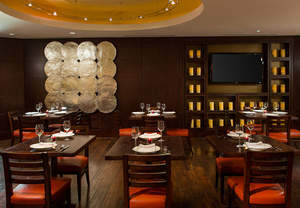 Travelers and locals alike can start the evening early with BELL20 American Tavern at Crystal City Marriott at Reagan National Airport, where every weekday this lively tavern rings in its specials before other bars in Crystal City with a starting bell at 3:20 p.m.